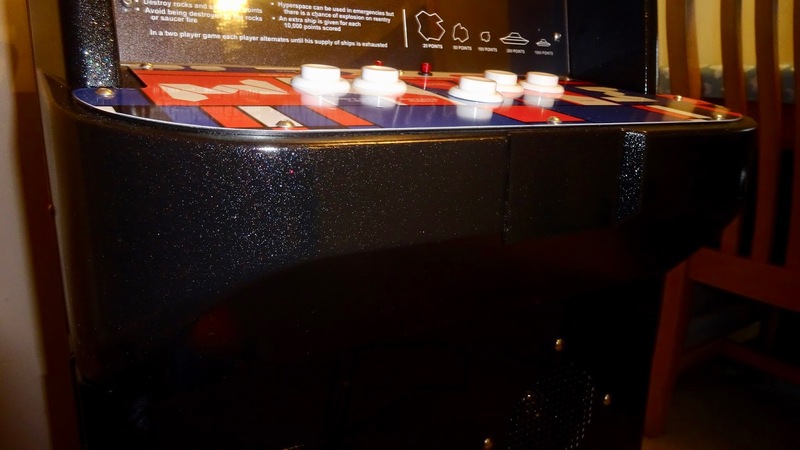 This project started a fair few years back after purchasing one of FrancoB's steel Dino King reproduction control panels. I went for a blank panel as I could see the potential to create a conversion of these tiny cabs at some point in the future even though I didn't own one at the time. Not knowing what it would be, I could always cute holes to my design in the future. 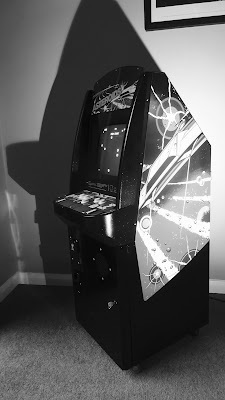 Fast forward another few years and I had the chance to buy a Dino King cab from a local friend. Most of the original hardware had been removed before I got my hands on it, all that was left was the metal cab, monitor, power transformer, metal brackets and internal shelving, it was a good solid cab but it was never going to play Dinosaur King again! So what was I to covert it into? 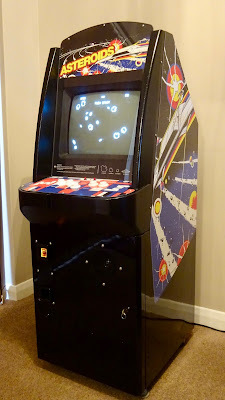 At the time Pac-Land, Ordyne and Wonder Boy were high on my list of idea's, I had the original PCBs for all of these games and thought they'd work well in the small form factor these cabs have. Well I didn't end up converting it to any of those, there's a long winding tale to how it ended where it did but it briefly goes like this. 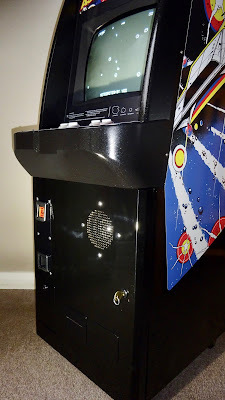 I traded my Atari Pole Position cabinet for a Saga Outrun cabinet. The Outrun was a bit more of a project than I'd hoped for, I took the working Outrun PCB out and used it in a Power Drift cab I had picked up, and then traded the the Outrun cabinet for a complete set of parts to make an Atari Asteroids. So I pretty much had all the components needed to play Asteroids and yes that was going to be the game my conversion was for. I decided that first I would need to get all the hardware working. Here's a list of the bits that needed fixing; The game PCB was faulty, the Deflection PCB on the monitor was faulty and typically for me the Atari Power brick that provides the AC voltage to the monitor didn't provide the needed voltages for the black and white vector monitor, so I would have to make a work around to get the monitor powered. Along with the conversion of the cab itself I had a lot to do and that's why it took me a few years to get it all done. 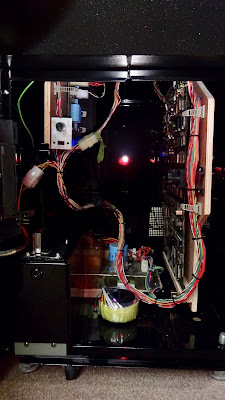 After the hardware was working (the PCB was repaired elsewhere and I had a Meteorites Bootleg PCB for testing with) , I stripped out the remains of the Dino cab and laced in the Atari wiring and made new mounting plates for the Atari parts. The basic layout of the wiring loom was partially completed before the components were removed for powder coating. Next up was the need to layout the control panel mounting for the buttons. Olli (muddymusic) had kindly been working on making so custom art to fit the Dino size and layout for me since December 2015 when I first discussed the project with him. I got what we'll call revision one of the overlay and temporarily fixed it to the met control panel. with this in place I marked up the button holes and proceeded to to press out the button holes with a tool Vic Marland (Virtvic) had loaned me. Well during the cutting of the second hole the tool broke! That was the end of cutting holes in panels and I gave the broken tool back to Vic along with the panel and he finished it off. We realised the button layout of the overlay were too close together and these were widened to accommodate, there were also a few errors in the graphic in the overlay that got tweaked at the same time. When control panel overlay revision two arrived, it was all a great fit and alignment of all the buttons was spot on. Revision 1 of the CPO shown below, some alignment changes were needed after measurements were confirmed. I decided that to make this conversion stand out and work well, It couldn't stay painted bright orange! Perhaps if it was DK Jr. I'd have been happy but Asteroids warranted a slightly darker paint scheme. Gloss black was the chosen colour, and my local Powder Coaters did the job within a few weeks. 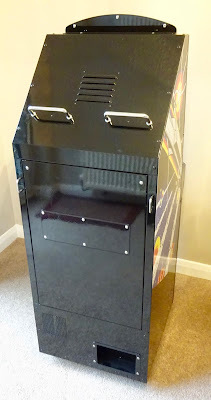 Having received the art package, I was keen to fit the side art to the cab now it had come back from the painters. 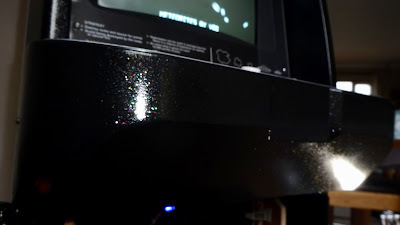 Next on my list of things to do was to concentrate on the plastic monitor surround. This part needed a small repair as it had been damaged before I received it. With some strong glue, a piece of aluminium plating and some light sanding, the repair was complete and ready for paint. 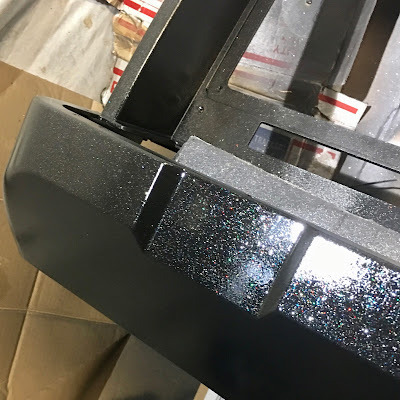 I decided on a Satin Black spray which would be topped with some sparkly glitter and clear lacquer. After using one can of Satin Black it was time for some wet & dry sanding. Another can of Satin Black sprayed on. Clear lacquer for a lasting finish, freshly sprayed and still wet. 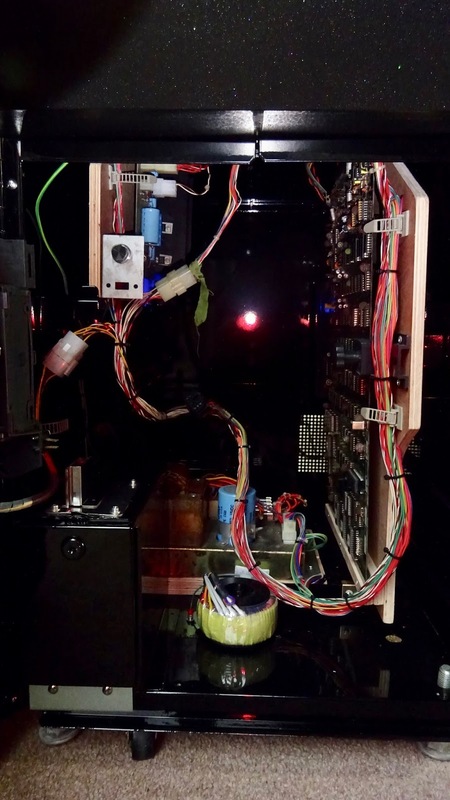 Control Panel, monitor surround and perspex front all assembled and ready to meet up with the rest of the cab. Next year I plan to refurbish the Power Brick, the AR PSU and the monitor Deflection and HV PCB's to hopefully give increased reliability over the coming years. Some misc photos from throughout the conversion. Anyone know if a 'Cathy N' worked on the production line at Atari. Nice little 'easter egg' in the original Atari metalwork? Martin (Milky) For selling me the DinoKing in the first place. 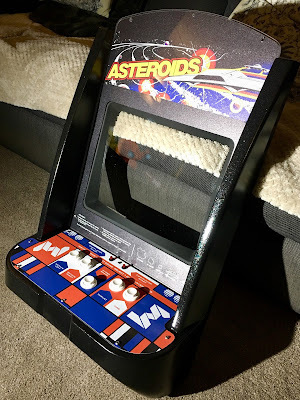 Nad (Equites) Who met me at a service station in the pouring rain to trade the Asteroids parts for the Outrun cabinet. Olly (muddymusic) from Arcade Art Shop for his custom Artwork which has made this project something to stand out from the crowd. Vic (Virtvic) from the Ten Pence Arcade podcast for his metalwork skills in punching my control panel layout. 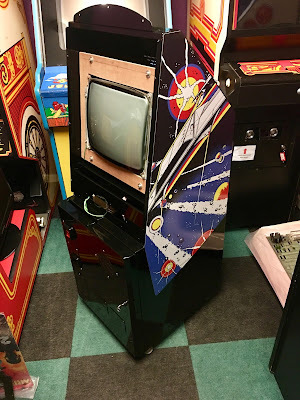 Dave Flynn for his wise words on how the original Dino cabinets are wired together, also for clearing out my leftovers of brackets, metal work and odd and sods of Dino King parts.